Answers to common questions about Sonic Vitamins and brainwave entrainment. Got questions about our Sonic Vitamin sessions? No problem; we've got the answers! We know that brainwave entrainment can be confusing. That’s why at Sonic Vitamins, we've created this special FAQ page to provide answers to your questions. Just scroll down to read the relevant questions and answers. If you have any other questions, you can always contact us by clicking here. So, what are Sonic Vitamins? What does 'brainwave entrainment' feel & sound like? What can I use Sonic Vitamins for? How long does it take for Sonic Vitamins to work? Will the Sonic Vitamins downloads work on my computer? How quickly will I get my Sonic Vitamins session? How should I listen to my Sonic Vitamins session? Sonic Vitamins are quick audio recordings, which use special sounds to influence your brainwaves - and change how you feel. Each recording features brainwave entrainment technology, which recreate certain brainwave frequencies, and bring about key states of mind - all in just minutes. Relax, sleep, improve your mood, focus more - whatever you want to do, the Sonic Vitamins website probably has a session to suit you! Every 30-minute session also contains a mixture of natural sounds and gentle music, to help get you in the ideal frame of mind. Just sit back, hit play - and get ready to change your mood! Special sound patterns are used in our recordings, which have been scientifically-verified to change your brainwaves. The brain actually "follows" the frequency patterns we play to it. In the science world, this process is called brainwave entrainment. Our recordings combine two powerful brainwave entrainment techniques - binaural beats and isochronic tones - to create the most effective recordings possible. Binaural beats work by using two tones to create a third frequency inside the head, which the brain follows. Isochronic tones use tiny audio pulses to change brainwave patterns. By combining these two methods, we're able to effectively influence brainwave patterns - and bring about specific states of mind, such as focus, creativity, sleep, and more. We know what frequencies produce the best results by using EEG machines to check brainwave "signatures" when individuals are in certain states. For example, individuals that are experiencing creativity and relaxation are typically in the 8-12Hz Alpha range. With Sonic Vitamins, we've created a series of sessions which recreate these key brain states, using brainwave entrainment technology. Practically, this means you can now change how you feel - just by slipping on a pair of headphones, and hitting "Play." Everybody is capable of getting into "The Zone," being more creative, or relaxing after work. We all reach these states of being naturally from time to time. Sonic Vitamins helps you to influence your brainwave patterns, to ensure that you reach these states when YOU want - rather than just hoping that particular feeling will hit. They're scientifically proven to work with EVERYONE, and every session comes with a money-back guarantee. Whenever you feel the need to meditate, take a power nap, or perform at your peak, just select and listen to the appropriate Sonic Vitamins session. The more often you listen, the quicker you’ll be able to get into the state you’re after. The technology is completely harmless, so you don’t need to worry about damaging your brain or anything like that. ANYONE can benefit, and we're positive it’ll work for you. Note: Please read our full FDA disclaimer. Do not use if you suffer from epilepsy, or certain other conditions. What does 'brainwave entrainment' feel and sound like? You won’t even notice it! The brainwave entrainment noises themselves are “cloaked” in the specially recorded soundtracks. You can’t hear them, so the most you’ll feel is a slight change in your attitude or disposition. For most people the experience is a relaxing and pleasant one. You just listen to the soundtrack and let the technology bring about the change in your state of mind. There’s nothing uncomfortable to worry about and you won’t suffer any unpleasantness: just high-quality recordings to help you get where you want to go mentally. Most of our recordings contain atmospheric sounds, mixed with beats and pulses. You can listen to an MP3 sample of several clips by clicking here. This file contains 5 x 10 second samples from across our catalog. Sonic Vitamins recordings present you with a wide range of possibilities… from boosting your energy, to helping you exercise, to preparing for a night out on the town! You can use the powerful brainwave entrainment technology to lift your mood, help you study, access deep relaxation, sharpen your thinking, focus your mind, brainstorm for ideas... and much, much more! Once you tap into the right state of mind, you can achieve practically anything. Sonic Vitamins can help you do that quickly and almost effortlessly, putting you in control of your brain. Your brain cells are not at risk! The special technology works to help you change mental state more quickly. You can reach these states by yourself, such as when you’re daydreaming or if you manage to get into “The Zone” when you’re totally focused on a particular task. The difference with Sonic Vitamins is that they allow you to get into these states at your convenience, rather than waiting for them to come along. "Can I get stuck in one state?" No way! After listening to the recording of your choice, you’ll enter the state of mind you hoped to reach. Eventually, though, the everyday world will take over and you’ll come out of that state naturally. There’s absolutely NO possibility of you staying in a particular state for longer than you want to. "I'm too intelligent for the technology to have any effect, surely?" If you listen to the recordings, they’ll produce the desired results. They represent another approach to self-development, making the process as simple and effortless as it can possibly be. The more intelligent you are, the easier you’ll find it to get into the state of your choice. How long does it take for Sonic Vitamin Sessions to work? Most of our Sonic Vitamin sessions are 30 minutes long, so you can expect to reach the desired state within that time. Each of the 14 Sonic Vitamin recordings uses the latest brainwave technology to produce maximum results in the shortest time possible. Simply follow the listening instructions and you’ll be able to achieve the desired state of mind quickly and easily! We provide all of our Sonic Vitamin downloads as MP3 files - which you can use anywhere! You can listen to the MP3 audio file on your computer. Most of the sessions produce maximum benefit when listened through stereo headphones. You can also play the MP3 file using Windows Media Player, RealPlayer, iTunes, and other related PC tools. MP3 files will work on ANY computer - including all versions of Windows, Linux and Macintosh computers. You might want to burn your MP3 file to an audio CD, so you can play it in any regular CD player. Or you could transfer it to an MP3 device, such as an iPod, iPhone or Blackberry, to listen to it when you’re on the move. 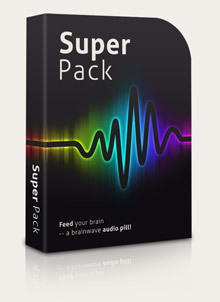 Your Sonic Vitamins download will absolutely work for you. We guarantee it! When you purchase a download from Sonic Vitamins.com, you’ll receive download links immediately via e-mail. In most cases, simply relax, slip on your headphones and listen as the recording guides you into the state of your choice. You can listen to certain sessions without headphones, and these are indicated in the product details where you make your purchase. We provide full listening instructions with each purchase, so you’ll always know exactly how to get the best out of each recording. We guarantee that you’ll be completely satisfied with the Sonic Vitamins sessions you purchase from us... or we’ll provide you with a complete refund, no questions asked! To learn more and read full details of our guarantee, please click here. We have a dedicated support site set up to answer any queries you may have. Use the support beacon on the right to connect with us.